Rudolf Barshai’s professional association with Shostakovich lasted until the composer’s death. The success of his five transcriptions and arrangements of Shostakovich’s string quartets was a catalyst for re-workings of nearly the entire cycle from string ensemble to full orchestra. The essential naivety and understatement of the First Quartet is here discreetly underlined by the larger string ensemble. 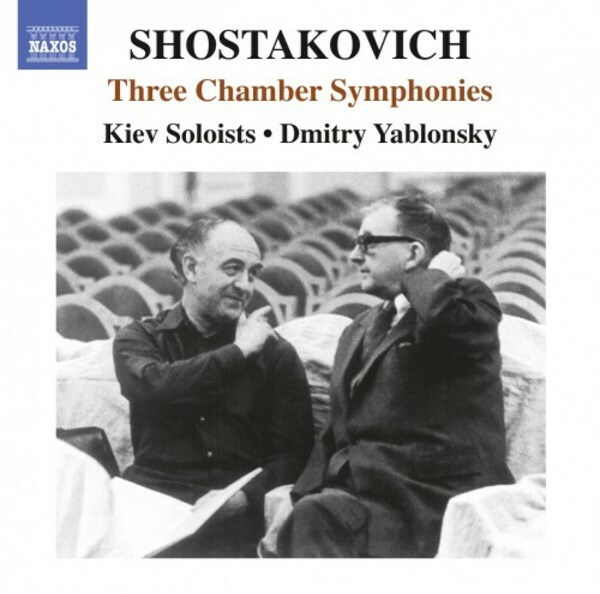 This contrasts with the broodingly autobiographical Eighth Quartet, the searing emotions of which have made it the best known of Shostakovich’s quartets. Barshai’s transcription of the Fourth Quartet is his most ambitious and interventionist, the addition of winds and percussion emphasising the work’s symphonic dimension. This is the debut CD of the National Chamber Ensemble “Kiev Soloists”. Based in the Ukrainian capital, this orchestra has earned national and international recognition as one of Ukraine’s leading orchestral ensembles. Dmitry Yablonsky is a Grammy nominated conductor with numerous acclaimed Naxos recordings to his name, including a 2011 album of Azerbaijani Piano Concertos (8572666) considered “a brilliant introduction to the classical music of Azerbaijan” by MusicWeb International.